In celebration of African American History Month, the Medical Center Archives is excited to publish a new research guide about the history of African Americans at the Medical Center. The guide aims to introduce researchers to materials documenting the history of African American faculty, students, and staff at Duke Medicine. Included are recommended oral histories, archival collections, photograph and AV items, and publications, selected key dates and key figures, and links to suggested digital resources. To view the guide, visit: http://guides.mclibrary.duke.edu/afam. We are happy to announce that our new exhibit, "Head to Toe: Medical Attire Past & Present," is now on display. 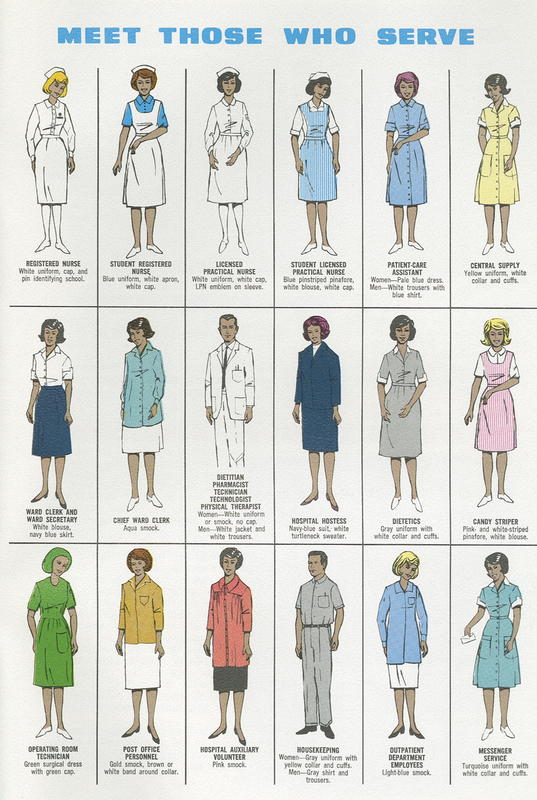 Featuring clothing and accessories from the Medical Center Archives collections, the exhibit explores the role of apparel in the health profession, and particularly at Duke Medicine, over the past 75 years. Items include an original 1970's era Duke nursing student uniform, an early medical bag of a Duke physician, and a graduation cap of the first School of Medicine Dean, Wilburt Davison, as well as historical photographs and documents. Though we are a relatively small department, our mission is big: to serve the Medical Center community by collecting, preserving, maintaining, and making available for research the permanent records of the DUMC and DUHS. To this end, the Archives offers a broad range of records management services to departments and offices across campus at no cost to our users. Please join us on Thursday, January 29 at noon for a lecture by Dr. John J. Freiberger, “The Past and Present of the Duke University Hyperbaric Chamber.” The talk will be held in Room 102 of the Medical Center Library & Archives. This event is free and open to the public. Light refreshments will be available. Last month the School of Medicine welcomed alumni back to campus for the annual Medical Alumni Weekend. This week, we look at the origins of this tradition in honor of the first medical reunion which was held on November 29th, 1940. The Duke Medical Alumni Association was established in 1940 and organized the first reunion later that year. The second meeting, held April 24-26, 1947, was attended by 281 alumni and featured presentations on various medical topics and a business meeting. The program for this meeting is pictured on the right. Reunions were held every three years (with a hiatus for World War II) until 1959 when an alumni weekend in its current form was proposed. The DUMC Archives has a large collection of oral histories documenting the medical center’s history. In this post, we’re highlighting three that were conducted with individuals who worked with Dr. Grace Kerby. Kerby, who first came to Duke in 1940 as a research assistant in the Department of Pathology, is notable for a few “Duke firsts.” In 1946 she was the first female chief resident in the Department of Medicine, and in 1964 she became the first female full professor in the department. Additionally, from 1965 to 1971 she was the chief of the Division of Rheumatic and Genetic Disease in the Department of Medicine, the first female to become a division chief in the department. The DUMC Archives Fall/Winter 2015 newsletter is now available! To read it, visit: /newsletters. If you’d like to subscribe to our newsletter, email us at: dumc.archives@mc.duke.edu. Celebrate Halloween with the DUMC Archives! The Duke University Medical Center Archives is hosting a Halloween event at the MCL&A featuring a selection of eerie, fascinating, and rarely seen materials from our collections. Brave souls are invited to gaze upon spine-chilling artwork, stare into the faces of frightening death masks, behold macabre medical artifacts and instruments, and much more! Halloween candy will be available…for those who haven’t lost their appetite. The MCL&A’s new exhibit, “Under Pressure: Hyperbaric Medicine at Duke” is now on display. Featuring the Duke Center for Hyperbaric Medicine and Environmental Physiology, the exhibit charts the Center’s development, activities, and achievements since its beginnings in the early 1960s. Items on display include documents, photographs, and promotional materials spanning the Center’s history. This month Duke Medicine celebrated completing 1,000 heart transplants, a milestone relatively few medical centers in the country have achieved. 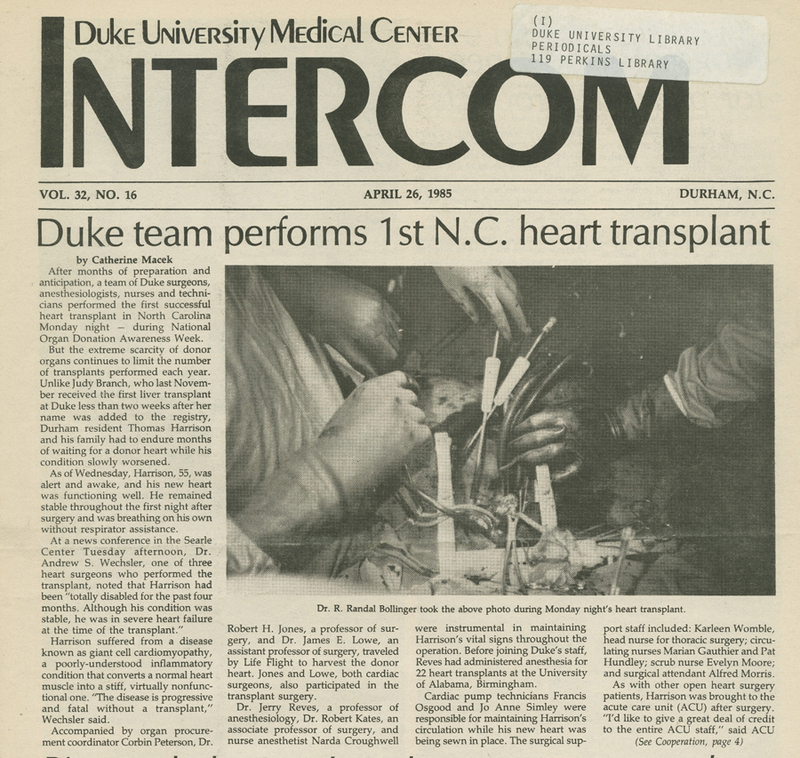 In honor of this, we wanted to take a look back to where it all started: Duke's very first heart transplant. This April 1985 issue of the Intercom recounts the intense preparation and work involved in the surgery, which included a team of surgeons, anesthesiologists, nurses, and technicians. Click on the image to enlarge and read the first page of the article. New Collection Added to the Archives!